In Terry Gilliam’s “The Brothers Grimm ,” the Monty Python animator turned visionary director has crafted a fictitious spin on the lives of the 19th century folklore collectors . Jacob (Heath Ledger) and Will (Matt Damon) Grimm are scam artists who travel the Napoleonic countryside convincing towns to pay them to get rid of monsters and demons who don’t actually exist. Or so they thought. 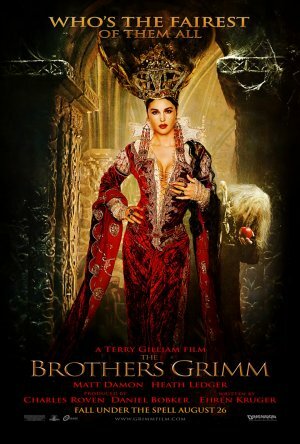 Grimm’s (or is it Grimms’) fairy tales have served as the frameworks for hundreds of movies. Storytelling is an art form that’s a constantly evolving thing; as tales pass through the ages, they become updated and altered to better suit the audience (Johnny Knoxville and Seann William Scott are not your parents’ “Dukes of Hazzard ”). While we may first think of the animated Walt Disney versions of “Snow White and the Seven Dwarves ,” “Cinderella ” and “Sleeping Beauty ,” there have been some variations that are a tad more twisted. Sigourney Weaver stars in “Snow White: a Tale of Terror ” (1997), subtitled presumably to warn off clueless parents who’d expose the tykes to this decidedly un-Disneyfied live action adaptation. In the film, Weaver plays Claudia, an unbalanced woman whose miscarriage only increases her resentment of her young, beautiful stepdaughter, Lilliana (Taryn Davis). Fleeing a murder attempt, Lilliana finds herself holed up with a grubby band of seven gold miners who initially plan to hold her captive for ransom. When Lil’ is finally done in by the poison apple, it takes an accidental heimlich by Will (one of the surrogate dwarves, a scarred commoner rather than a handsome prince) to bring her back. They return to Lilli’s father’s castle just in time to stop Claudia from slashing his throat. And there’s no Dopey. Perhaps no other Grimm tale has been retold more often than “Cinderella,” from the 1914 German short “Aschenbrödel” to Rodgers and Hammerstein’s 1965 musical to “Pretty Woman ” (1990) to “Ella Enchanted ” (2004) and, heck, why not, “Cinderella Man ” (2005). 1998’s “Ever After ” delivers a “Cinderella” tale minus the fairies. Drew Barrymore plays Danielle de Barbarac, a virtual servant to her horrible stepmother (Anjelica Huston) and her callow daughters. She meets the handsome Prince Henry (Dougray Scott) as he’s stealing a horse from their stable, but you know how girls go for the bad boys! The movie keeps the Cinderella story grounded in reality, eliminating glass slippers, pumpkin carriages and fairy godmothers, leaving a surprisingly effective romantic period piece. 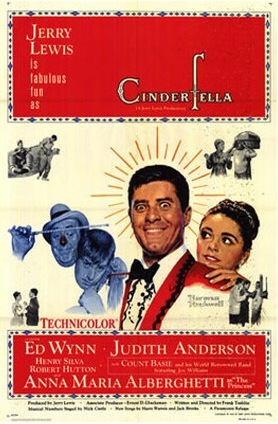 But our favorite Cinderella story (aside from Carl’s imaginary golf triumph in “Caddyshack ”) remains the 1960 gender twisting “Cinderfella .” Directed by former animator Frank Tashlin, the film stars Jerry Lewis as ‘Fella and the fun-to-say Anna Maria Alberghetti as Princess Charming. It’s Lewis’ usual klutzy mugging schtick, but set in an updated fairy tale milieu. When the fairy godfather (Ed Wynn) gives Fella his makeover, Lewis turns into a swanky lounge lizard kinda guy who swings to the sounds of Count Basie. Much maligned by those who can’t wrap their esthetic around the genius of Jerry, “Cinderfella” isn’t his best film, but it’s a lot of fun. The classic Warner Bros. Looney Tunes and Merrie Melodies skewered many fairy tales, none more hilariously than the 1944 Warner Bros. cartoon, “Little Red Riding Rabbit .” A brash bobby soxer is bringin’ a li’l bunny rabbit... for her Gramma.... TA HAVE! Naturally, as that bunny rabbit has the first name of Bugs, things aren’t so cut and dry for Red, even before the wolf shows up. The wolf has no interest in Red, he wants to eat Bugs, but by the end of the cartoon, they’re both so annoyed with the grating granddaughter that SHE become the climactic victim. The 2000 TV mini-series “The Tenth Kingdom ” mixed many of the brothers’ yarns into an epic story of an alternate fairy-tale universe stumbled upon by a bored New Yorker (Kimberly Williams) and her father (John Larroquette). Their struggle to find a magic mirror and return to our universe (while, of course, having to help save the kingdom from an evil queen) features cameos by older versions of Snow White (Camryn Mannheim), Cinderella (Ann-Margret) and Red Riding Hood (Kim Thomson). One reason filmmakers love to monkey around with fairy tales is that they all exist in that copyright and royalty-free world of the public domain. This means that anyone can put out a version of “Snow White ” without paying for rights or fear of lawsuit (something that drives the litigious Disney Corp. crazy). The irony is, many parents proscribe some kind of proprietary rights to the House of Mouse and feel that some less sanitized versions of beloved fairy tales aren’t acceptable. But in fact, the original Grimm stories are really, really grim. In their version of “Cinderella,” the evil stepsisters slice off pieces of their feet to fit into the glass slipper, and in the end their eyes are plucked out by pigeons as punishment for their selfish ways. It’s amusing to imagine Disney animators trying to figure out a way to make those scenes cute.